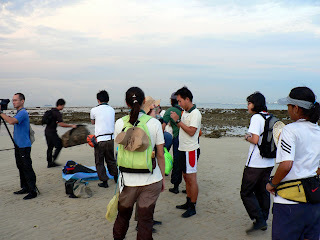 On a fine Thursday morning, we gathered at West Coast Pier to head for Cyrene Reef. Our boat was really really REALLY slow and we decided to name it the "Onchi Boat" after our dear onchs. 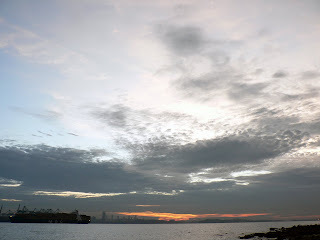 The sunrise was phenomenal as our boat approached the reef which seemed to rise up from the sea as the tide moves away. 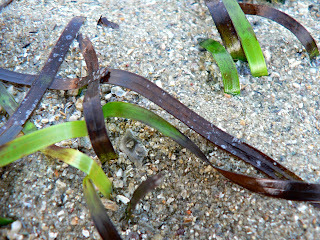 Finally on dry land after the amphibious landing, we wasted no time to get everything up and kicking. You can see that as the tide goes out, it magically reveals the marvellous Cyrene which in other times, submerged under water. 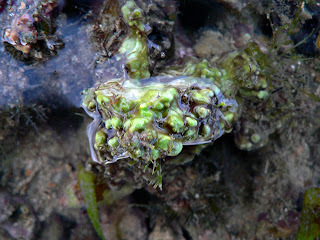 This thing felt hard, is it some green coralline algae? 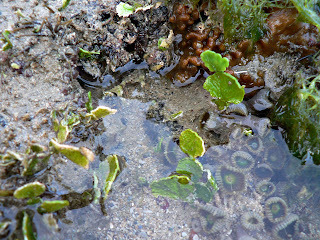 Hard corals and soft corals grow together side by side. 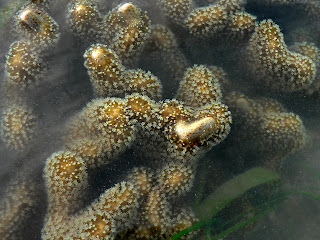 The leather coral (Sarcophyton sp. 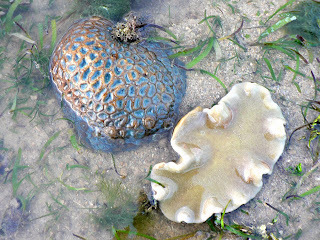 )on the right has long polyps and might engage in chemical warfare with the hard coral beside it whe it grows bigger. 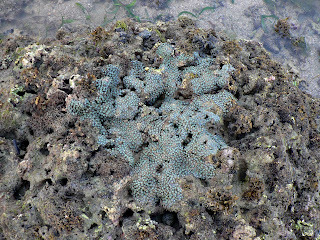 A colony of zoanthids growing on coral rubble. 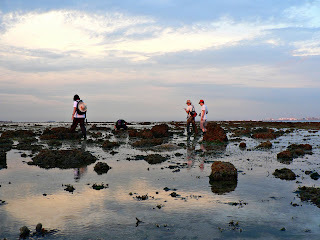 Do you know that zoanthid polyps are all connected to each other? Yet if you cut the tissue joining them, each would colonise again into another colony. 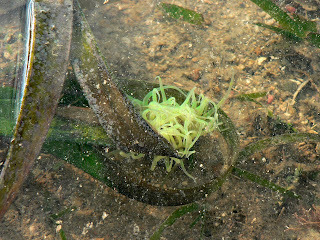 This interesting looking creature is actually a worm that lives inside a tube that it makes. The feathery projections are used to trap food particles drifting in the water. It'll then retract into the tube to consume its food. 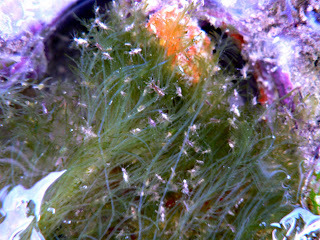 If you look closely, there are some red specks on the crown and I'm guessing these are microscopic organisms living together with it. 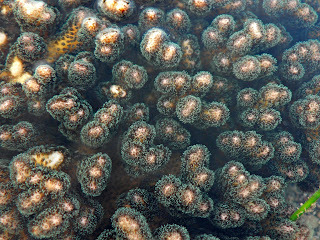 Is hard coral (Pocillopora sp.) 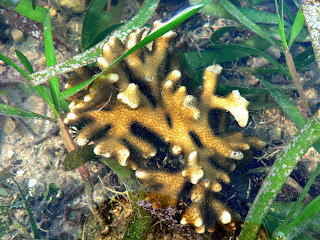 has neon green polyps and are frequently used in coral research studies. 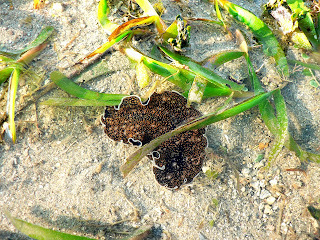 I only managed to find 1 such colony of this coral but Shufen said she saw quite a few... guess I need to buck up my spotting skills. This one looks like the one above right? Its actually a leather coral which is a soft coral. 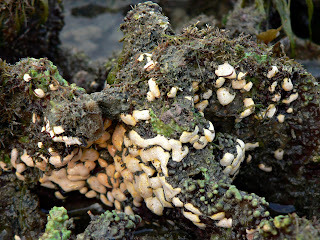 Quite amazing that corals can look so alike each other. This is another hard coral (Montipora digitata) and Ron was very interested to find these especially big colonies as he said seahorses live among them. 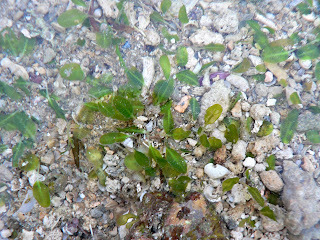 But try as we might, the team did not find any seahorses on the trip. 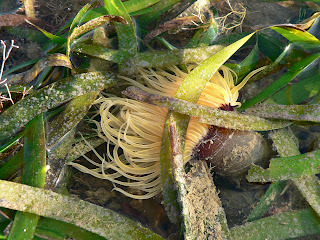 I saw quite a few tube anemones too and I'm never once not amazed by these creatures. 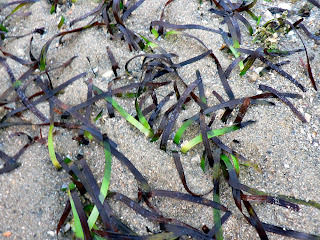 They come in all sorts of colours from orange to pink to green to purple. 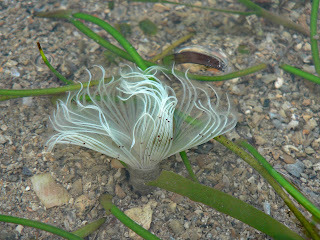 And the fact that they live in a tube makes them so different from the anemones we tend to associate the name with! This one actually came out of its tube! Wonder whether its stressed or eating something? 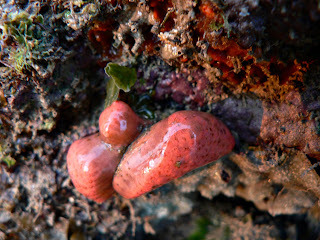 There were lots of ascidians too and they also come in all sorts of wacky colours. 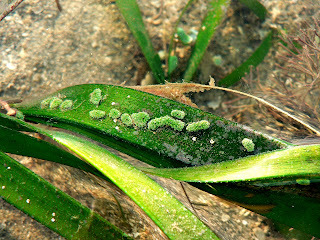 And green ones living on the blades of seagrasses! 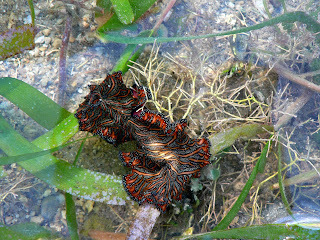 We also found some flatworms. 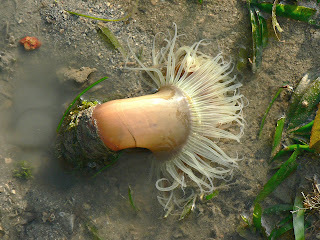 This one was found my Gaytri when we went exploring together. This phychedelic one was caught by Ron. 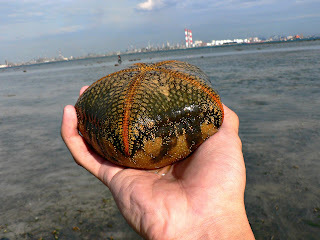 And you thought worms were long, ugly and squishy haha. 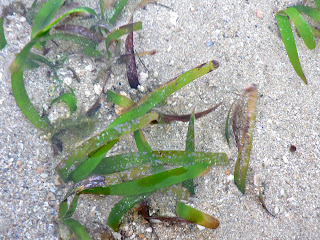 While hunting for the knobbly seastar with Ron, we chanced upon a school of eel tail catfish. 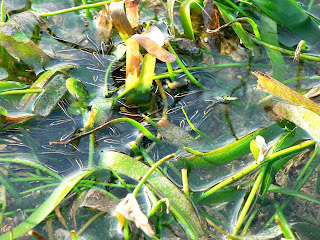 They look like little tadpoles from the surface. And we found what we were looking for. 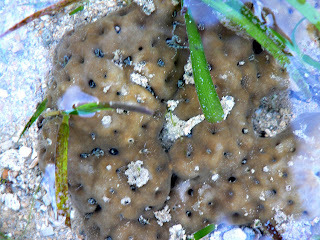 This is a juvenile knobbly seastar as its knobs had not fully developed yet. 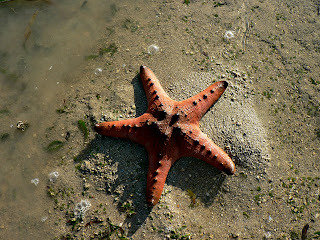 And straight after the knobbly seastar, Ron shouted for me from like 100m away and said he found a cushion star. Well, here it is! 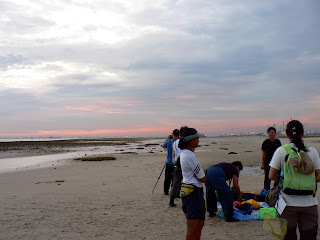 Was this encountered on 24 March 2007?